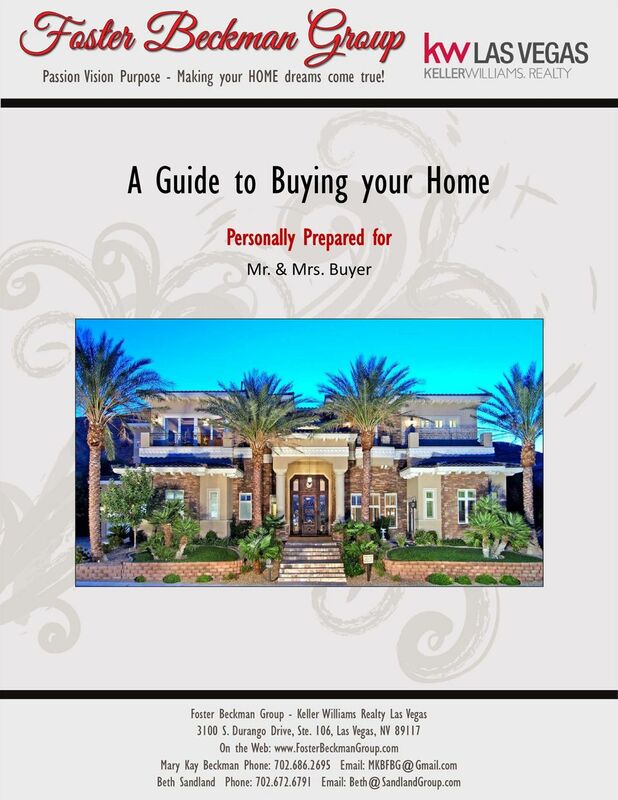 Download "A Guide to Buying your Home"
2 About Us Passion. Vision. Purpose. These words are synonymous with the Foster Beckman Group and the service we provide our clients! 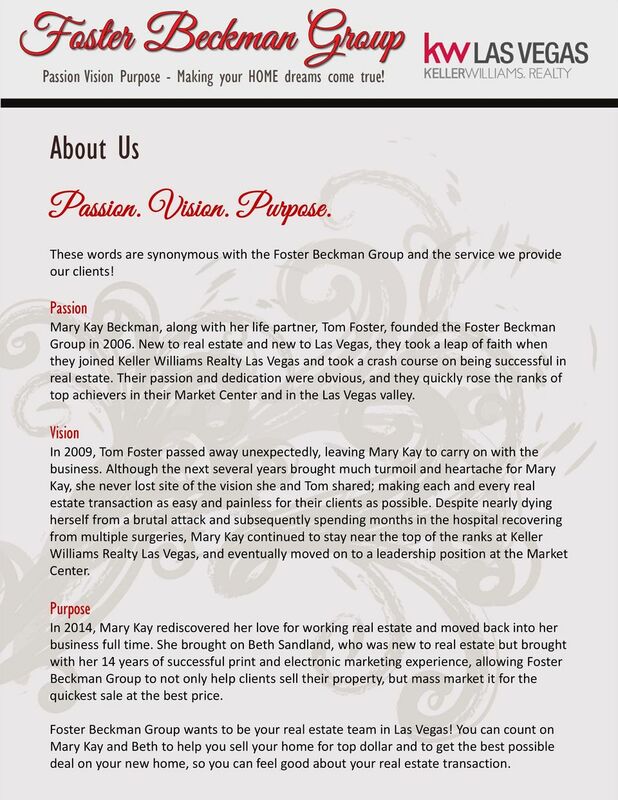 Passion Mary Kay Beckman, along with her life partner, Tom Foster, founded the Foster Beckman Group in New to real estate and new to Las Vegas, they took a leap of faith when they joined Keller Williams Realty Las Vegas and took a crash course on being successful in real estate. Their passion and dedication were obvious, and they quickly rose the ranks of top achievers in their Market Center and in the Las Vegas valley. Vision In 2009, Tom Foster passed away unexpectedly, leaving Mary Kay to carry on with the business. Although the next several years brought much turmoil and heartache for Mary Kay, she never lost site of the vision she and Tom shared; making each and every real estate transaction as easy and painless for their clients as possible. Despite nearly dying herself from a brutal attack and subsequently spending months in the hospital recovering from multiple surgeries, Mary Kay continued to stay near the top of the ranks at Keller Williams Realty Las Vegas, and eventually moved on to a leadership position at the Market Center. Purpose In 2014, Mary Kay rediscovered her love for working real estate and moved back into her business full time. She brought on Beth Sandland, who was new to real estate but brought with her 14 years of successful print and electronic marketing experience, allowing Foster Beckman Group to not only help clients sell their property, but mass market it for the quickest sale at the best price. Foster Beckman Group wants to be your real estate team in Las Vegas! 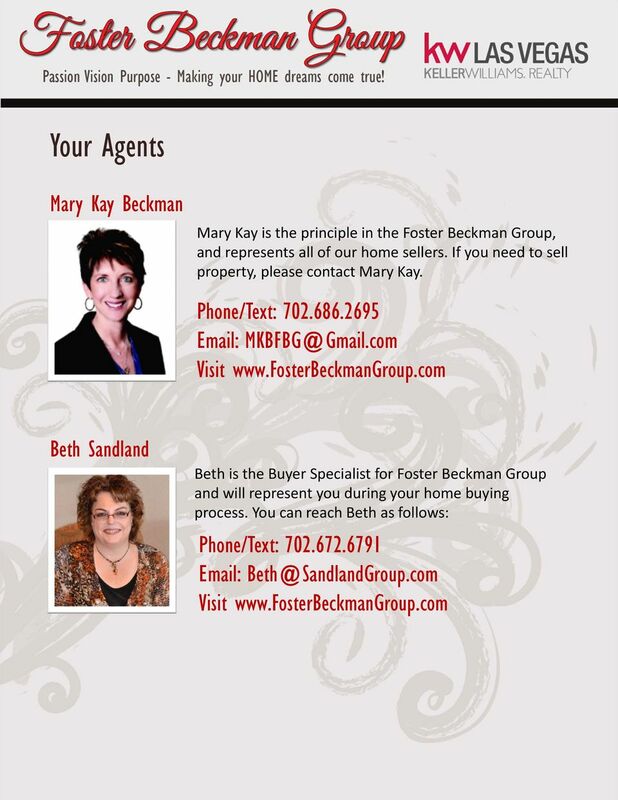 You can count on Mary Kay and Beth to help you sell your home for top dollar and to get the best possible deal on your new home, so you can feel good about your real estate transaction. 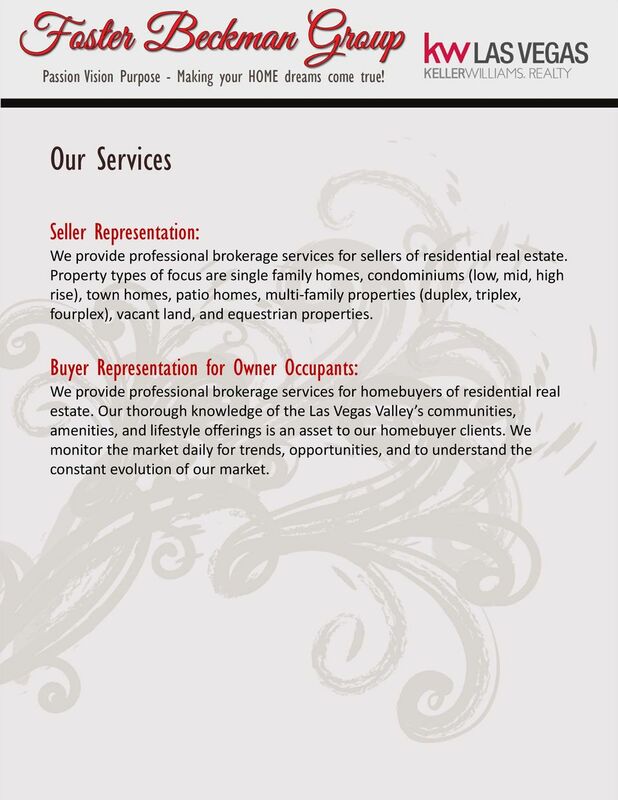 4 Our Services Seller Representation: We provide professional brokerage services for sellers of residential real estate. Property types of focus are single family homes, condominiums (low, mid, high rise), town homes, patio homes, multi family properties (duplex, triplex, fourplex), vacant land, and equestrian properties. Buyer Representation for Owner Occupants: We provide professional brokerage services for homebuyers of residential real estate. Our thorough knowledge of the Las Vegas Valley s communities, amenities, and lifestyle offerings is an asset to our homebuyer clients. We monitor the market daily for trends, opportunities, and to understand the constant evolution of our market. 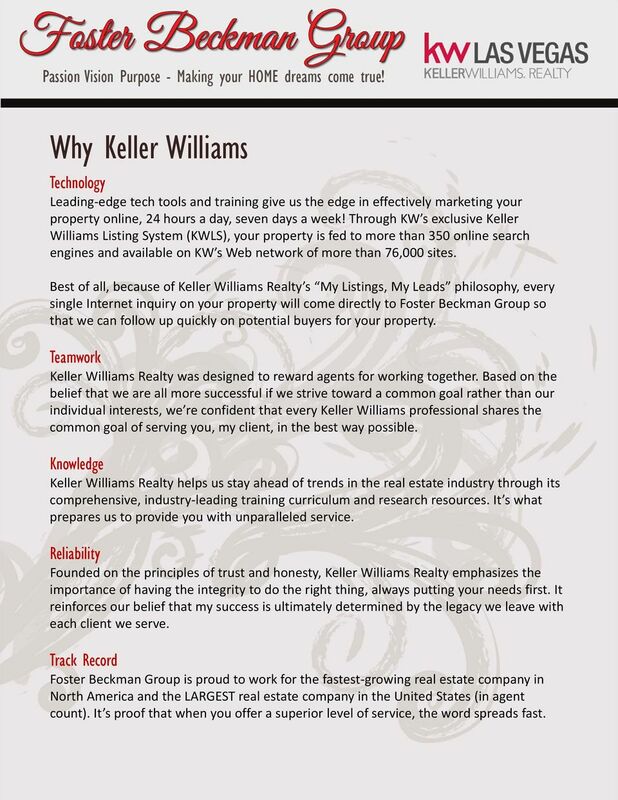 5 Why Keller Williams Technology Leading edge tech tools and training give us the edge in effectively marketing your property online, 24 hours a day, seven days a week! Through KW s exclusive Keller Williams Listing System (KWLS), your property is fed to more than 350 online search engines and available on KW s Web network of more than 76,000 sites. 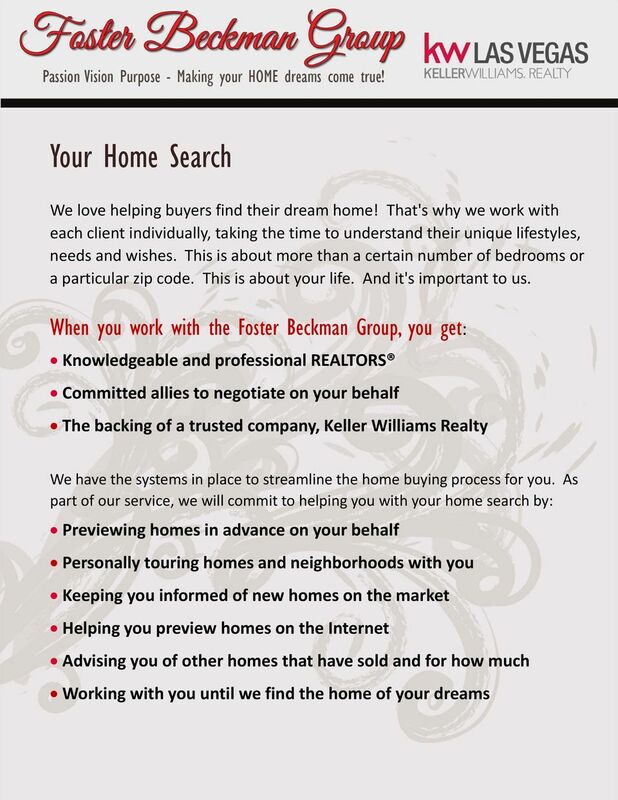 Best of all, because of Keller Williams Realty s My Listings, My Leads philosophy, every single Internet inquiry on your property will come directly to Foster Beckman Group so that we can follow up quickly on potential buyers for your property. 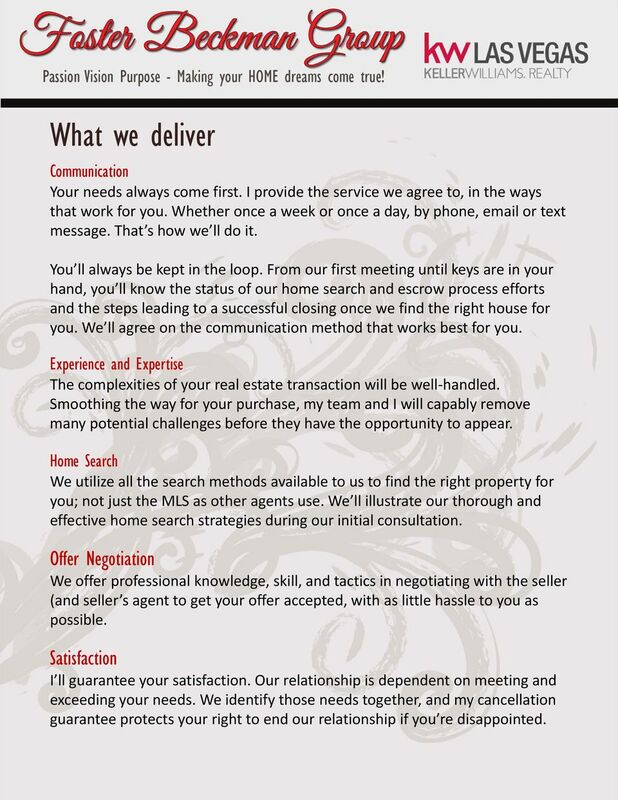 Teamwork Keller Williams Realty was designed to reward agents for working together. Based on the belief that we are all more successful if we strive toward a common goal rather than our individual interests, we re confident that every Keller Williams professional shares the common goal of serving you, my client, in the best way possible. Knowledge Keller Williams Realty helps us stay ahead of trends in the real estate industry through its comprehensive, industry leading training curriculum and research resources. It s what prepares us to provide you with unparalleled service. Reliability Founded on the principles of trust and honesty, Keller Williams Realty emphasizes the importance of having the integrity to do the right thing, always putting your needs first. It reinforces our belief that my success is ultimately determined by the legacy we leave with each client we serve. Track Record Foster Beckman Group is proud to work for the fastest growing real estate company in North America and the LARGEST real estate company in the United States (in agent count). It s proof that when you offer a superior level of service, the word spreads fast. 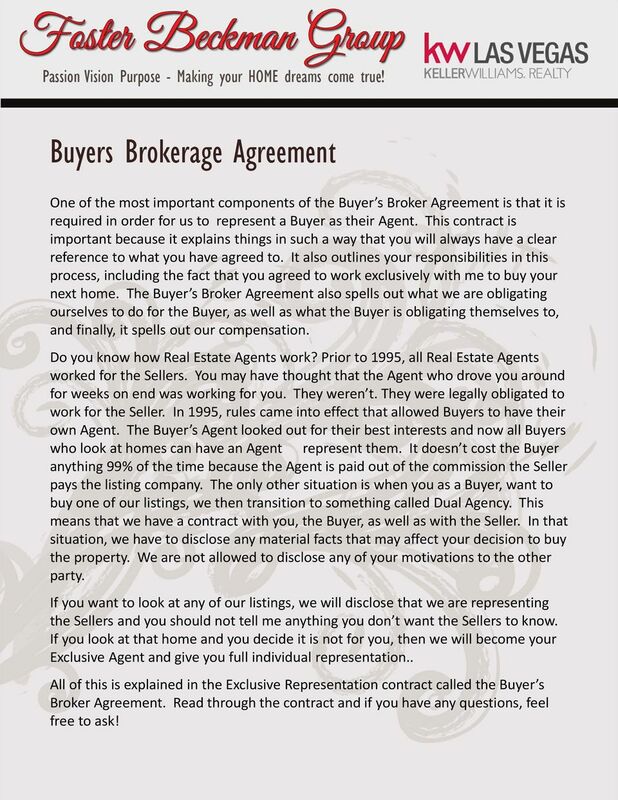 6 Buyers Brokerage Agreement One of the most important components of the Buyer s Broker Agreement is that it is required in order for us to represent a Buyer as their Agent. This contract is important because it explains things in such a way that you will always have a clear reference to what you have agreed to. 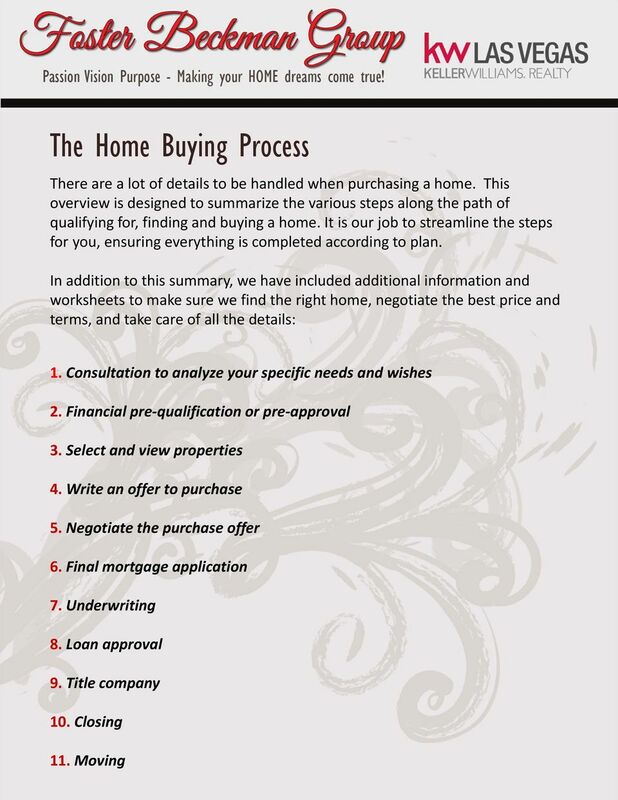 It also outlines your responsibilities in this process, including the fact that you agreed to work exclusively with me to buy your next home. The Buyer s Broker Agreement also spells out what we are obligating ourselves to do for the Buyer, as well as what the Buyer is obligating themselves to, and finally, it spells out our compensation. Do you know how Real Estate Agents work? Prior to 1995, all Real Estate Agents worked for the Sellers. You may have thought that the Agent who drove you around for weeks on end was working for you. They weren t. They were legally obligated to work for the Seller. In 1995, rules came into effect that allowed Buyers to have their own Agent. The Buyer s Agent looked out for their best interests and now all Buyers who look at homes can have an Agent represent them. It doesn t cost the Buyer anything 99% of the time because the Agent is paid out of the commission the Seller pays the listing company. The only other situation is when you as a Buyer, want to buy one of our listings, we then transition to something called Dual Agency. This means that we have a contract with you, the Buyer, as well as with the Seller. In that situation, we have to disclose any material facts that may affect your decision to buy the property. We are not allowed to disclose any of your motivations to the other party. If you want to look at any of our listings, we will disclose that we are representing the Sellers and you should not tell me anything you don t want the Sellers to know. If you look at that home and you decide it is not for you, then we will become your Exclusive Agent and give you full individual representation.. All of this is explained in the Exclusive Representation contract called the Buyer s Broker Agreement. Read through the contract and if you have any questions, feel free to ask! 7 What we deliver Communication Your needs always come first. I provide the service we agree to, in the ways that work for you. Whether once a week or once a day, by phone, or text message. That s how we ll do it. You ll always be kept in the loop. From our first meeting until keys are in your hand, you ll know the status of our home search and escrow process efforts and the steps leading to a successful closing once we find the right house for you. We ll agree on the communication method that works best for you. Experience and Expertise The complexities of your real estate transaction will be well handled. Smoothing the way for your purchase, my team and I will capably remove many potential challenges before they have the opportunity to appear. Home Search We utilize all the search methods available to us to find the right property for you; not just the MLS as other agents use. We ll illustrate our thorough and effective home search strategies during our initial consultation. Offer Negotiation We offer professional knowledge, skill, and tactics in negotiating with the seller (and seller s agent to get your offer accepted, with as little hassle to you as possible. Satisfaction I ll guarantee your satisfaction. Our relationship is dependent on meeting and exceeding your needs. We identify those needs together, and my cancellation guarantee protects your right to end our relationship if you re disappointed. 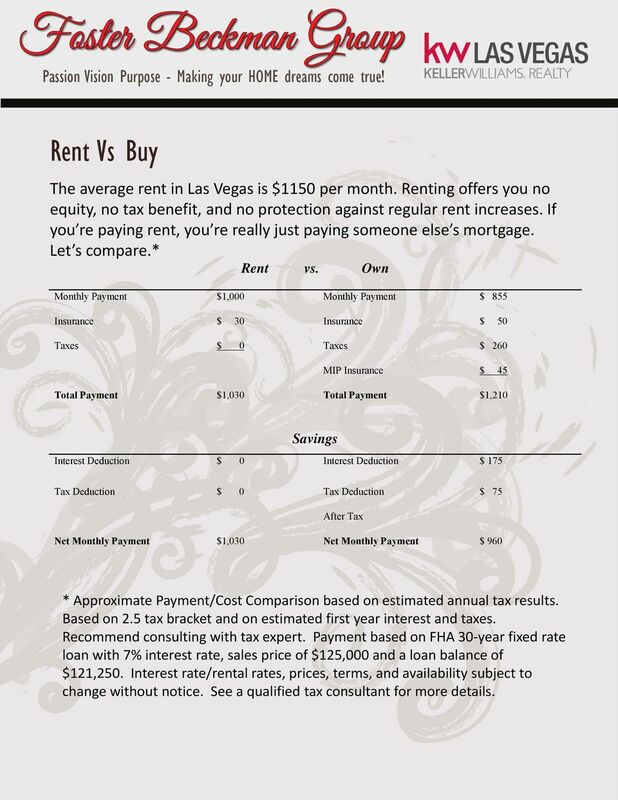 8 Rent Vs Buy The average rent in Las Vegas is $1150 per month. Renting offers you no equity, no tax benefit, and no protection against regular rent increases. If you re paying rent, you re really just paying someone else s mortgage. Let s compare. * Rent vs. Own Monthly Payment $1,000 Monthly Payment $ 855 Insurance $ 30 Insurance $ 50 Taxes $ 0 Taxes $ 260 MIP Insurance $ 45 Total Payment $1,030 Total Payment $1,210 Savings Interest Deduction $ 0 Interest Deduction $ 175 Tax Deduction $ 0 Tax Deduction $ 75 After Tax Net Monthly Payment $1,030 Net Monthly Payment $ 960 * Approximate Payment/Cost Comparison based on estimated annual tax results. Based on 2.5 tax bracket and on estimated first year interest and taxes. Recommend consulting with tax expert. Payment based on FHA 30 year fixed rate loan with 7% interest rate, sales price of $125,000 and a loan balance of $121,250. Interest rate/rental rates, prices, terms, and availability subject to change without notice. See a qualified tax consultant for more details. 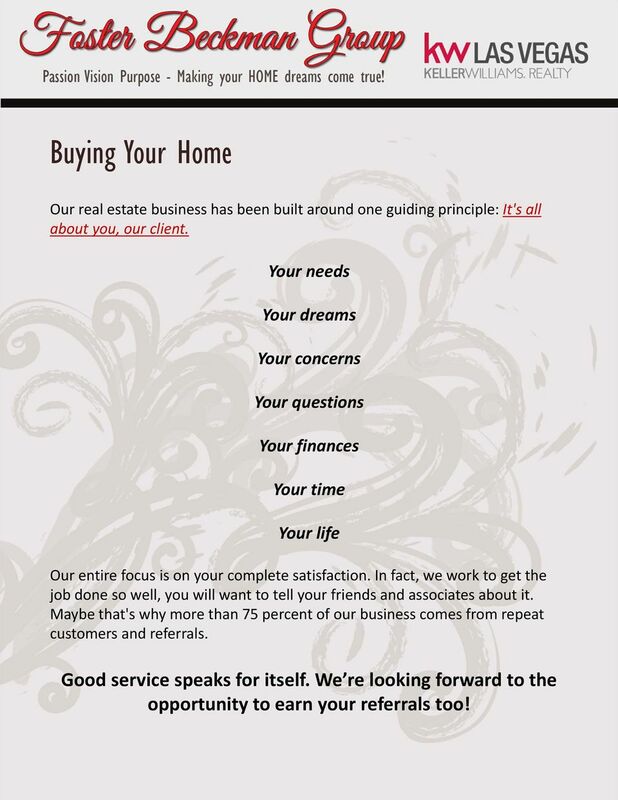 9 Buying Your Home Our real estate business has been built around one guiding principle: It's all about you, our client. Your needs Your dreams Your concerns Your questions Your finances Your time Your life Our entire focus is on your complete satisfaction. In fact, we work to get the job done so well, you will want to tell your friends and associates about it. Maybe that's why more than 75 percent of our business comes from repeat customers and referrals. Good service speaks for itself. We re looking forward to the opportunity to earn your referrals too! 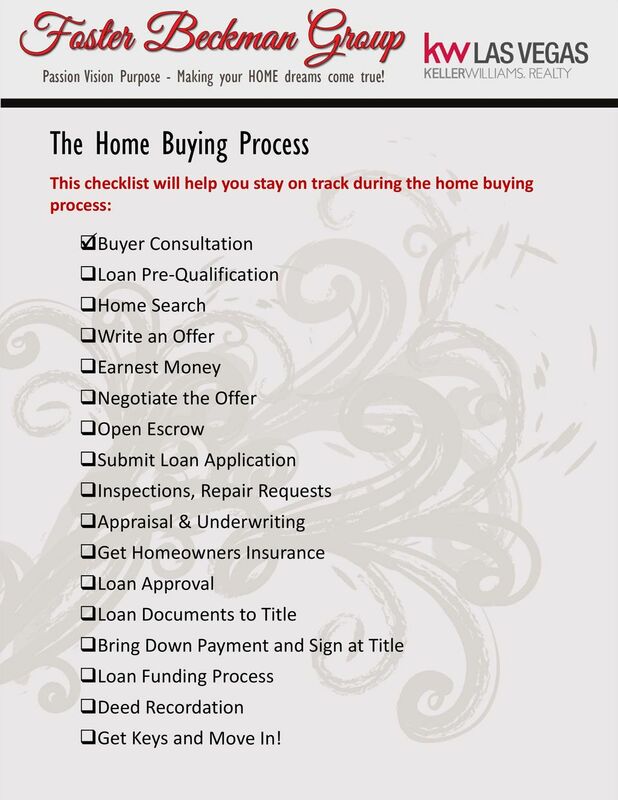 11 The Home Buying Process This checklist will help you stay on track during the home buying process: Buyer Consultation Loan Pre Qualification Home Search Write an Offer Earnest Money Negotiate the Offer Open Escrow Submit Loan Application Inspections, Repair Requests Appraisal & Underwriting Get Homeowners Insurance Loan Approval Loan Documents to Title Bring Down Payment and Sign at Title Loan Funding Process Deed Recordation Get Keys and Move In! 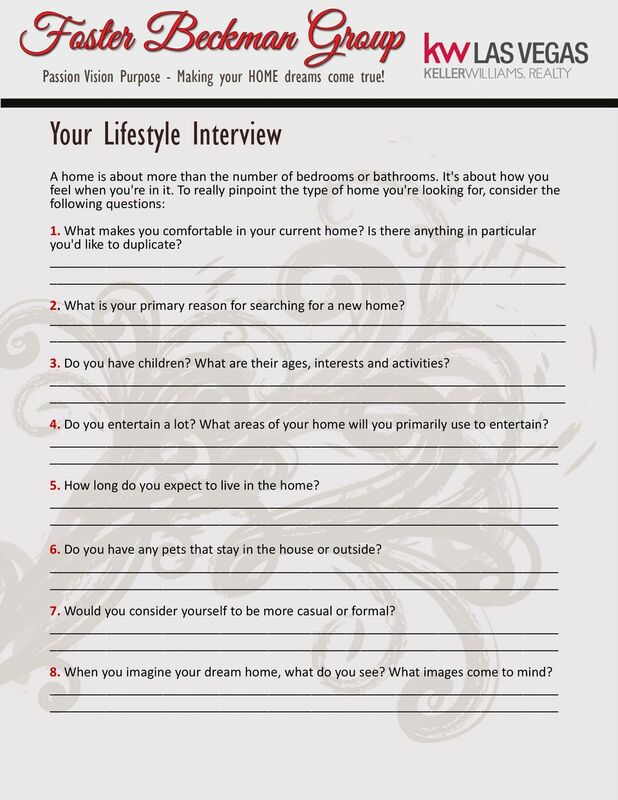 12 Your Lifestyle Interview A home is about more than the number of bedrooms or bathrooms. It's about how you feel when you're in it. To really pinpoint the type of home you're looking for, consider the following questions: 1. What makes you comfortable in your current home? Is there anything in particular you'd like to duplicate? 2. What is your primary reason for searching for a new home? 3. Do you have children? What are their ages, interests and activities? 4. Do you entertain a lot? What areas of your home will you primarily use to entertain? 5. How long do you expect to live in the home? 6. Do you have any pets that stay in the house or outside? 7. Would you consider yourself to be more casual or formal? 8. When you imagine your dream home, what do you see? What images come to mind? 17 Making Offers Once you have found the property (or properties) you want, we will write a purchase agreement (also known as the offer ). It is common in our market, at times, to write offers on more than one property, due to the competitive nature of the Las Vegas home buying climate. We ll discuss this more in our initial consultation. 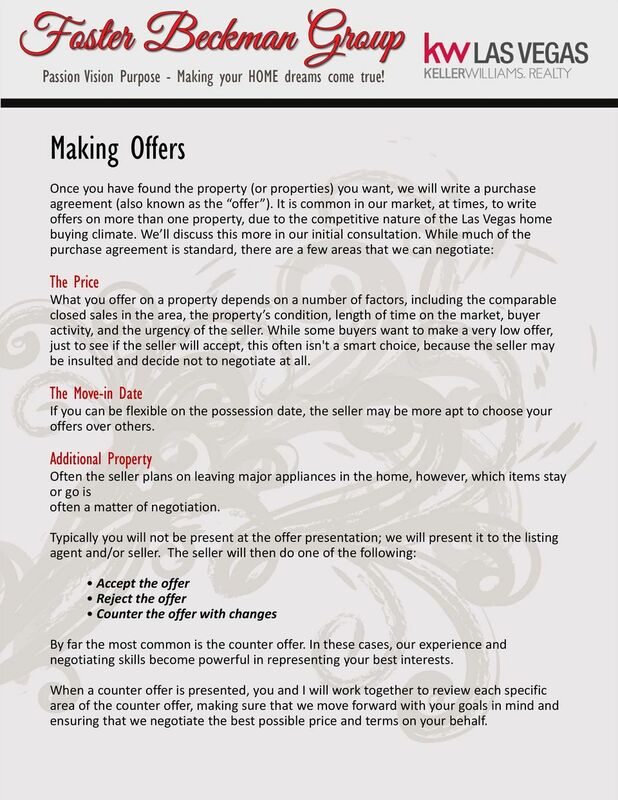 While much of the purchase agreement is standard, there are a few areas that we can negotiate: The Price What you offer on a property depends on a number of factors, including the comparable closed sales in the area, the property s condition, length of time on the market, buyer activity, and the urgency of the seller. While some buyers want to make a very low offer, just to see if the seller will accept, this often isn't a smart choice, because the seller may be insulted and decide not to negotiate at all. The Move-in Date If you can be flexible on the possession date, the seller may be more apt to choose your offers over others. Additional Property Often the seller plans on leaving major appliances in the home, however, which items stay or go is often a matter of negotiation. Typically you will not be present at the offer presentation; we will present it to the listing agent and/or seller. The seller will then do one of the following: Accept the offer Reject the offer Counter the offer with changes By far the most common is the counter offer. In these cases, our experience and negotiating skills become powerful in representing your best interests. When a counter offer is presented, you and I will work together to review each specific area of the counter offer, making sure that we move forward with your goals in mind and ensuring that we negotiate the best possible price and terms on your behalf. 18 Closing Prepare for it Closing day marks the end of your home buying process and the beginning of your new life! Your signing appointment at the escrow company will happen 1 3 business days before the closing occurs. 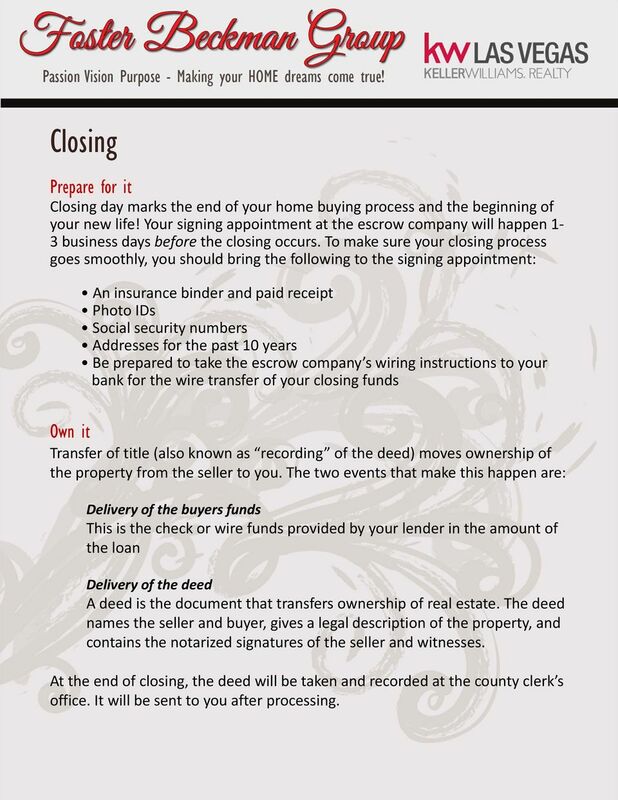 To make sure your closing process goes smoothly, you should bring the following to the signing appointment: An insurance binder and paid receipt Photo IDs Social security numbers Addresses for the past 10 years Be prepared to take the escrow company s wiring instructions to your bank for the wire transfer of your closing funds Own it Transfer of title (also known as recording of the deed) moves ownership of the property from the seller to you. The two events that make this happen are: Delivery of the buyers funds This is the check or wire funds provided by your lender in the amount of the loan Delivery of the deed A deed is the document that transfers ownership of real estate. The deed names the seller and buyer, gives a legal description of the property, and contains the notarized signatures of the seller and witnesses. At the end of closing, the deed will be taken and recorded at the county clerk s office. It will be sent to you after processing. 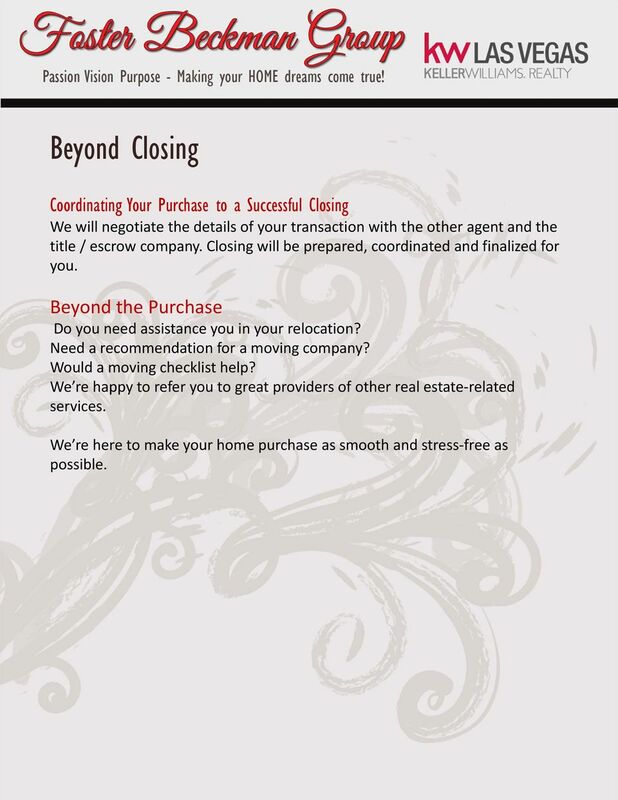 19 Beyond Closing Coordinating Your Purchase to a Successful Closing We will negotiate the details of your transaction with the other agent and the title / escrow company. Closing will be prepared, coordinated and finalized for you. Beyond the Purchase Do you need assistance you in your relocation? Need a recommendation for a moving company? Would a moving checklist help? We re happy to refer you to great providers of other real estate related services. We re here to make your home purchase as smooth and stress free as possible. 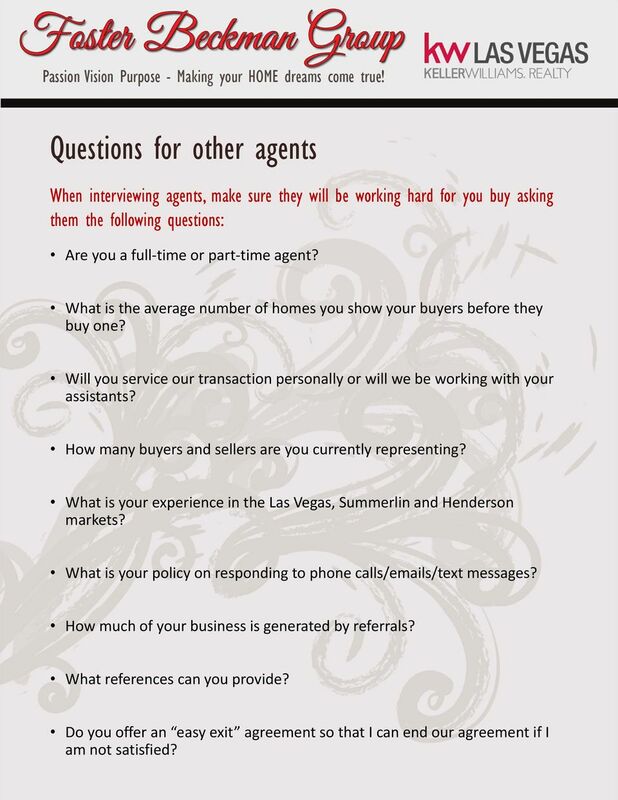 20 Questions for other agents When interviewing agents, make sure they will be working hard for you buy asking them the following questions: Are you a full time or part time agent? What is the average number of homes you show your buyers before they buy one? Will you service our transaction personally or will we be working with your assistants? How many buyers and sellers are you currently representing? What is your experience in the Las Vegas, Summerlin and Henderson markets? What is your policy on responding to phone calls/ s/text messages? How much of your business is generated by referrals? What references can you provide? Do you offer an easy exit agreement so that I can end our agreement if I am not satisfied? 22 FAQs How will you tell me about the newest homes available? We don t only use the Multiple Listing Service website, which provides up to date information for every home on the market as most other agents do. We also have an arsenal of other strategies we use to find you the right home, which we ll discuss at our initial consultation. On the MLS, we constantly check the New on Market list so we can be on the lookout for my clients. 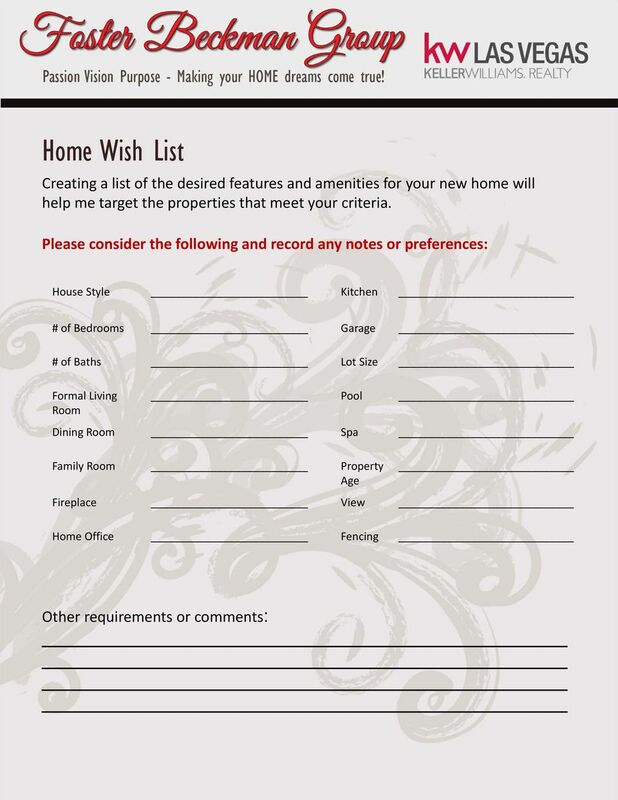 Can you help me find new construction homes? Yes, our team works with all builders in the Las Vegas valley and we will provide you with all the information you need to make a decision. On your first visit with the builder, we will accompany you. By using our services with a new construction home purchase, you will receive the services we offer, as well as those provided by the builder, at no additional cost. There is no financial advantage to not use our services with new construction. How does for sale by owner (FSBO) work? Homeowners trying to sell their home without agent representation are usually doing so in the hopes of saving the commission. If you see a FSBO and want the advantages of our services, let me contact the owner for you and make an appointment. Most times the homeowner will work with an agent, even though their home is not listed, since the agent is introducing a potential buyer to their property. Can we go back through our property again once an offer is made, but before possession? Usually we can notify the seller and schedule a convenient time to visit the property again. Immediately before the closing, we will schedule a final walk through and inspection of your new home. Once my offer is accepted, what should I do? Celebrate and focus on moving into your new home! You will want to schedule your move, pack items, and notify businesses of your address change. We will provide you with a moving checklist to help you remember all the details. We will also give you a good faith estimate and HUD statement, which will indicate the amount you will need to bring to closing. 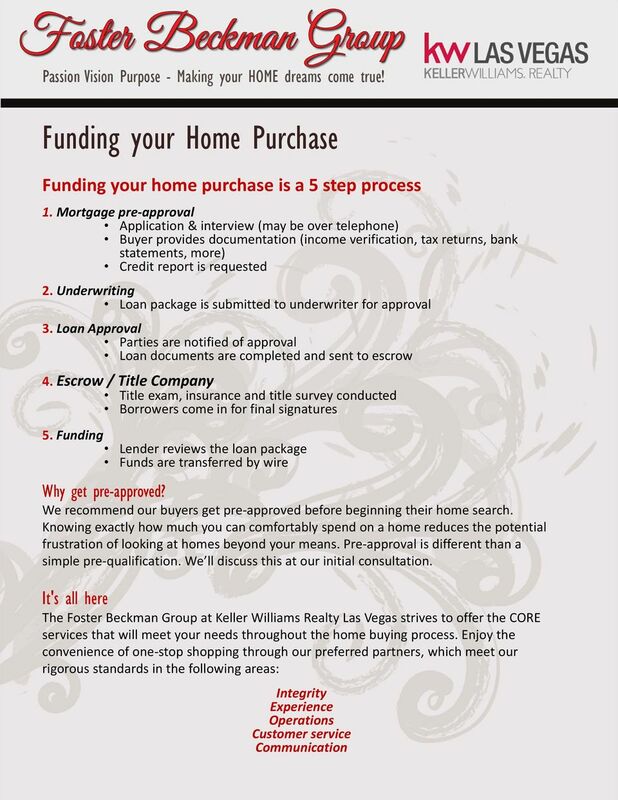 Home Buyer s Handbook Congratulations on deciding to purchase a home! The step by step process detailed here will get you off to a fantastic start to successfully being a superstar, informed home buyer. 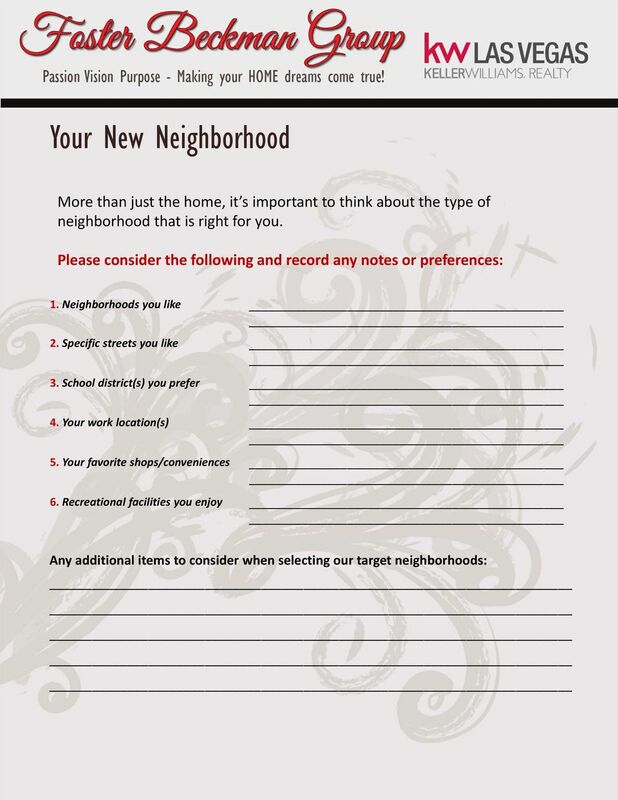 Buying A New Home with Our Mission Statement It is our mission to help you achieve your goals and exceed your expectations so you will never hesitate to refer us to your family, friends, and co-workers. Keller Williams Realty is ranked Highest Overall Satisfaction For Home Buyers Among National Full Service Real Estate Firms, Two Years in a Row! Fifth Third Home Buying Guide. A Guide to Residential Home Buying.